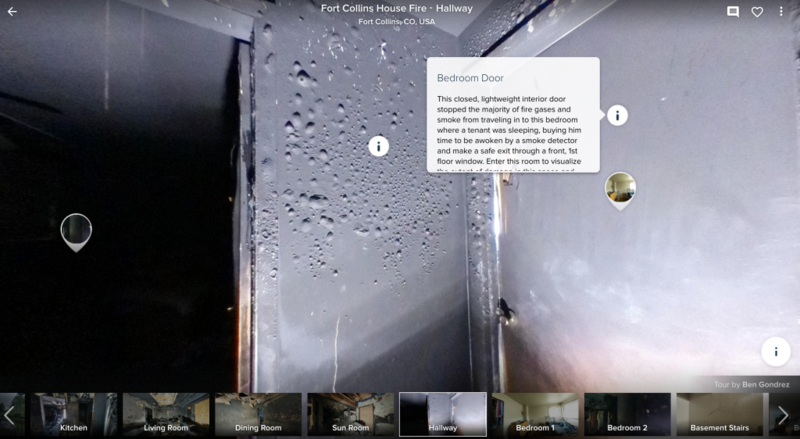 Learn more about the fire and how the virtual reality tour was made from Ben Gondrez of the Fort Collins Museum of Discovery and Michael Durkin from the Poudre Fire Authority. In August, a fire broke out in an off-campus house in Fort Collins, Colorado that was caused by a fire pit being improperly used on the deck. Adding to it, a 20-pound propane cylinder on a nearby gas grill vented during the fire, helping spread it into the eaves. Five students were able to escape because they were alerted by working smoke alarms whose batteries had been replaced just days prior to the fire. Two of them had to crawl out a basement window from their rooms because they were trapped by the flames. Several of the students had significant injuries and were hospitalized, but all have been released and returned to school. A dog died in the fire. 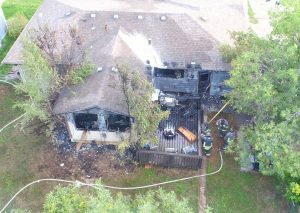 Two key points in this fire…first, working smoke alarms were instrumental in avoiding loss of life. This is the focus of a national campaign that Fort Collins is taking part in, the Town/Gown Fire Safety Community Service project where students are going alongside fire fighters and installing smoke alarms. This campaign is being coordinated nationwide by Campus Firewatch with smoke alarms donated by First Alert. The Poudre Fire Authority and the Fort Collins Museum of Discovery teamed up to create a virtual tour of the fire using a 360 degree camera. You can take the tour on a computer, but the real power comes when you use an app on your smartphone (Apple or Android and then search for Fort Collins Fire from the app) and put your phone in VR goggles to navigate it (I picked up a pair of goggles at Walmart for only $10.00). Click on the Play button to start the tour and navigate using your mouse. You can click on the three dots in the upper right corner of the tour to expand to full screen. This is a great way to immerse people into a fire scene, something they would normally not have the chance to do…and I really encourage you to try it on your smartphone with goggles, it is really impressive. In the desktop/laptop version, you can click on information points where they have annotated the tour. As you navigate through the house, which had pretty significant damage, you come across one room that is in pretty pristine shape because of – a closed door. Poudre Fire told me that they had a table on campus for the start of the academic year and the featured the fire and gave students an opportunity to use the goggles, and it was an incredible hit, they easily had twice as many students engaged. The shoot took about an hour using a Samsung Gear 360 camera, the photos were processed and then uploaded to RoundMe, and you can learn more in the video at the top of this page. If you want to embed the tour on your website, you can click on the three dots in the upper right corner of the tour and it gives you the embed code. This was a close call, and big kudos to Poudre Fire Authority and the Fort Collins Museum of Discovery for creating a powerful educational tool to help teach others!